Happy Halloween!! I wish I was sharing something a little more festive today, but I really have no particularly exciting Halloween updates... unfortunately. Buuut, the end of October for me always feels like a very fall time, so in lieu of Halloween, here's a quintessential fall outfit for ya! Everyone knows that one of the reasons why fall style is so fabulous is simply the option to layer, layer, and layer some more. 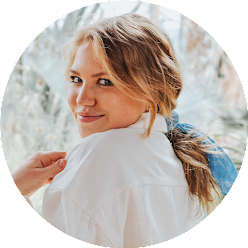 When it comes to layering up, I love sticking to timeless and preppy wardrobe staples like cable knit sweaters, neutral jackets, and plaid or gingham patterned accessories to mix and match for a comfortable and cozy look. However, when I noticed the "cold-shoulder" trend popping up on some items that otherwise would be just your average top or sweater, I decided to try it out and see if I could pull of the look! Of course, leave it to me to find the preppiest version of a trendy piece, but nevertheless I still am pretty excited about this sweater! 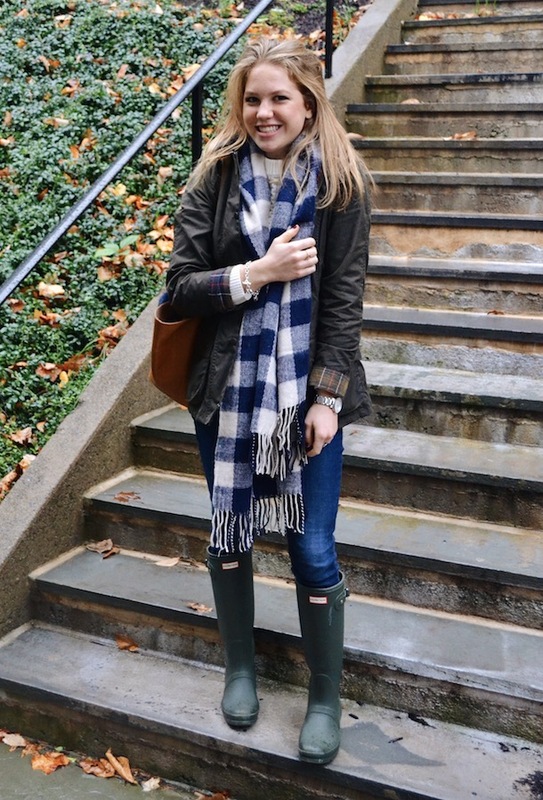 I paired it with my Barbour, this fun gingham scarf, and my trusty Hunter boots. It was super rainy the day I shot this outfit so I actually took these photos behind my dorm with one of my friend's right when I finished my classes. Surprisingly it's pretty warm this week in Bethlehem, but last week was really chilly and all of the layers were definitely necessary. Such a cute look. 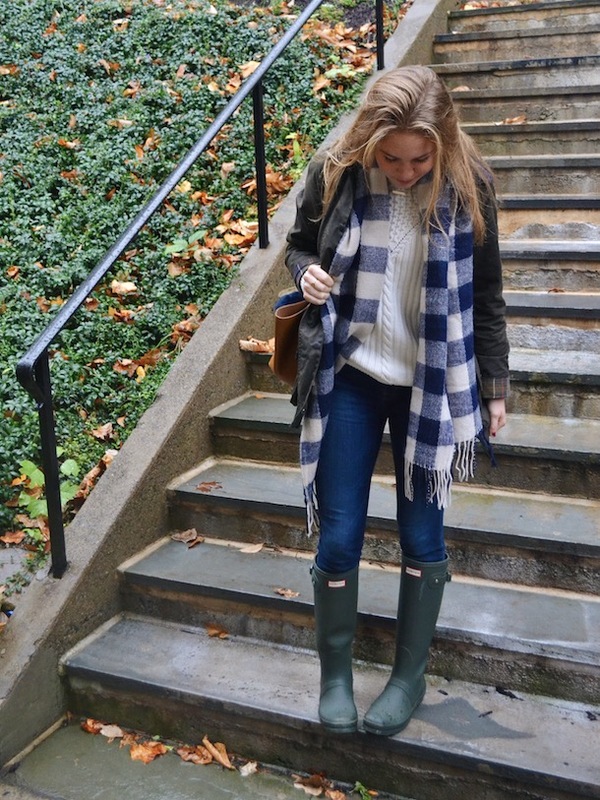 I like in my Barbour during the fall. Happy Halloween! 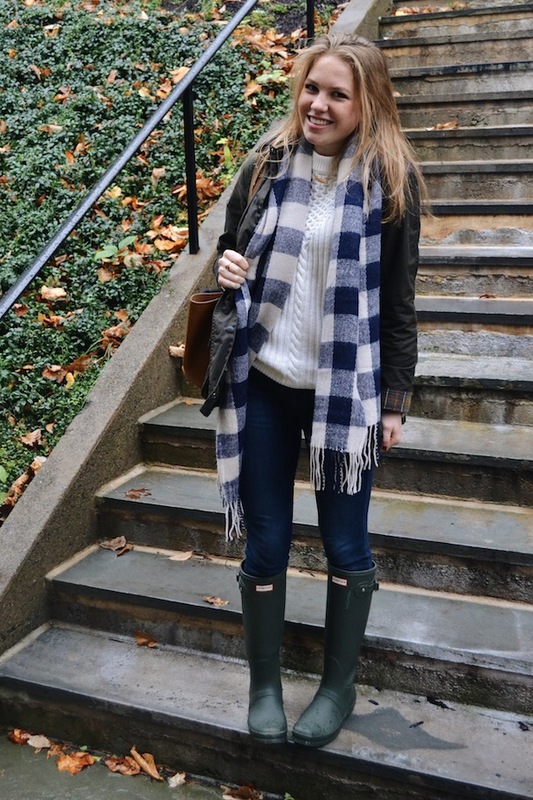 Buffalo check is one of my favorite prints for fall, I love how you added it as a pop to this outfit! This outfit is so cute, Frannie! Love it!